THE SPINAL POST: Salamanders Can Regenerate, Why Can't You? ScienceDaily (Dec. 9, 2009) — For more than 400 years, scientists have studied the amazing regenerative power of salamanders, trying to understand how these creatures routinely repair injuries that would usually leave humans and other mammals paralyzed -- or worse. Now, fueled by a highly competitive National Institutes of Health Grand Opportunity grant of $2.4 million, a multi-institutional team of researchers associated with the University of Florida McKnight Brain Institute's Regeneration Project has begun creating genomic tools necessary to compare the extraordinary regenerative capacity of the Mexican axolotl salamander with established mouse models of human disease and injury. Researchers want to find ways to tap unused human capacities to treat spinal cord injury, stroke, traumatic brain injury and other neural conditions, according to Edward Scott, principal investigator for the GO grant and director of the McKnight Brain Institute's Program in Stem Cell Biology and Regenerative Medicine. 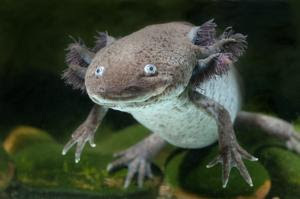 "The axolotl is the champion of vertebrate regeneration, with the ability to replace whole limbs and even parts of its central nervous system," Scott said. "These salamanders use many of the same body systems and genes that we do, but they have superior ability to regenerate after major injuries. We think that studying them will tell us a lot about a patient's natural regenerative capacities after spinal cord injury and nerve cell damage." The issue of what controls organ regeneration was named among the top 25 major questions facing scientists in the next quarter century by Science magazine in 2005, Scott said. With medical science continually adding years to the human lifespan, the importance of "rebuilding and restoring" old tissues and organs is growing. But science had to enter the 21st century to fully explore the use of the highly regenerative axolotl as a model for human disease.